German Horseradish Mustard for sale. Buy online at Zingerman's Mail Order. Gourmet Gifts. Food Gifts. Coarsely ground with a quick zip of horseradish. 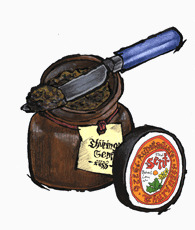 Friedrich Morgenroth is the eighth generation to make Kleinhettestedt mustard, so named for the 700-year-old village where the mill is located. Thankfully his son is training to follow in his footsteps, so we should be assured of mustard through our lifetime. It's made in relatively small batches with giant millstones in a slow, cool process similar to Raye’s. Packed in hefty gorgeous stone crocks that you’ll never want to throw away. Kleinhettestedt mustard has a remarkable texture. The seeds are suspended in a thick mash that's between coarse and smooth. It's substantial. I find myself taking a bite and chewing a little to enjoy the flavor, something I wouldn't do with a completely smooth mustard. The horseradish (meerrettich) mustard is fairly coarsely ground. You can still feel the texture of tiny mustard seeds in your mouth, kind of like a raspberry. Despite the name, it's only got a light whisper of heat. It's light on the tongue and has a piercing aroma—a zip of horseradish zing slips up your nostrils. Not too much, though. It's very well balanced. Use it on pretzels, sandwiches and roast pork. Slather them thick on both sides of the bun with a charred grilled hamburger and melted slice of Cabot Zingerman's Cheddar. If you made some homemade bratwurst, then this would be a perfect accompaniment. Anyone who likes traditional central European food will enjoy a crock.